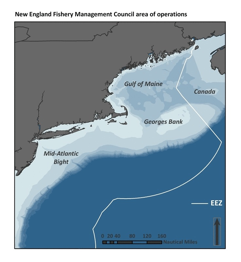 The New England Fishery Management Council, one of eight regional councils established by federal legislation in 1976, is charged with conserving and managing fishery resources from three to 200 miles off the coasts of Maine, New Hampshire, Massachusetts, Rhode Island, and Connecticut. The management authority of the Council extends to the Gulf of Maine, Georges Bank, and southern New England, and overlaps with the Mid-Atlantic Council for some species in that region. Major ports include Portland, ME, Gloucester and New Bedford, MA, and Point Judith, RI. The five principal state official with marine fishery management responsibility (or a designee) for Maine, New Hampshire, Massachusetts, Rhode Island and Connecticut. Twelve members nominated by the governors of the New England coastal states and appointed by the Secretary of Commerce for three-year terms (they may serve a maximum of three consecutive terms). In addition, four non-voting members represent the United States Coast Guard, U.S. Fish and Wildlife Service, U.S. Department of State, and the Atlantic States Marine Fisheries Commission.